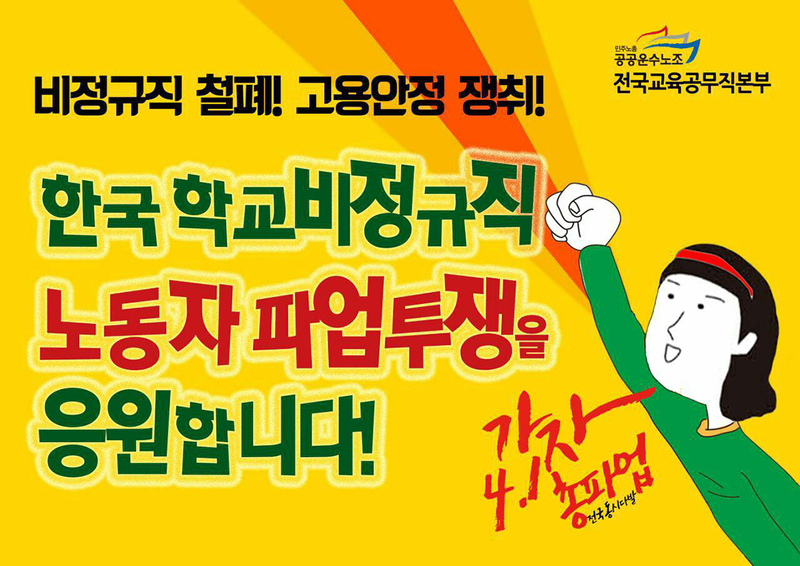 Take action - support the Korean Education workers! Take a picture of yourself and/or fellow union officers/members holding them. The Korean government is cutting funding to education while seeking to introduce new laws that will expand precarious work throughout the economy. It has already announced guidelines that make it possible for school principals and the heads of other public institutions to fire workers based on subjective evaluation systems and weaken the role of unions. On April 1 KPTU-EdSol and other education support workers unions will go on a 24-hours strike to oppose the government’s regressive policies and call for improvements in working conditions and job security for all education support workers. This strike is part of KPTU-EdSol’s long-term campaign for legislation that will regularise the status of permanent education support workers as public education employees. Education support workers in South Korea have been unionising rapidly. Over the last few years they have organised as the Education Workers Solidarity Division of the Korean Public Service and Transport Workers’ Union (KPTU-EdSol) and won their first collective bargaining agreements through successive strike actions. Last year, KPTU-EdSol elected its second-term leadership – made up of women education support workers representative of the membership.